Photograph of British cavalry in the recently liberated town of Albert, September 1918. Captured by German troops during the Ludendorff offensive in April 1918, the French town of Albert near the Somme battlefield was recaptured during the Allied counter-offensive four months later. 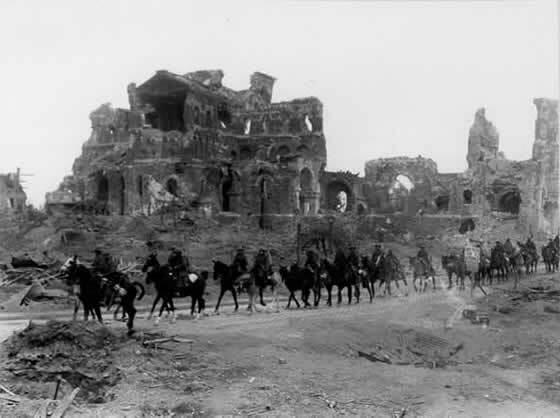 In this photograph, British cavalry troops are seen moving past the ruined basilica of the Notre Dame de Brebières, whose famous Golden Virgin statue - left hanging from the tower of the basilica after a German artillery offensive in January 1915 - had finally been toppled by British guns in April 1918. Legend had stated that the war would end when the statue fell.